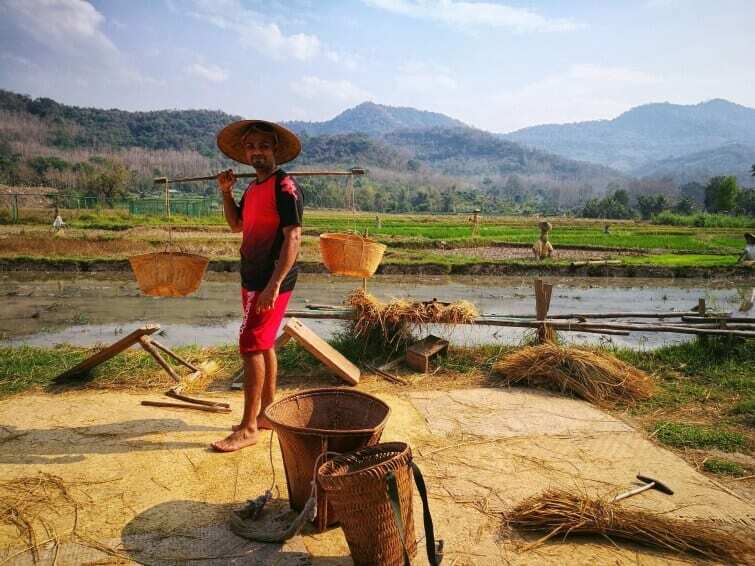 The living land rice farm in Luang Prabang, Laos is about 5KM from the city center. 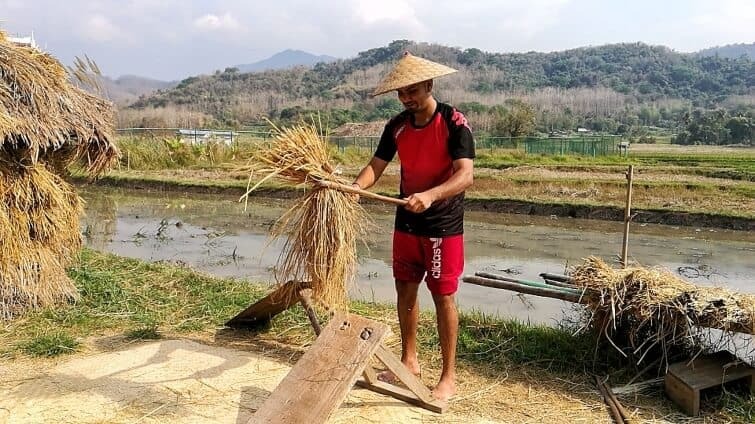 This rice farm is run by The Living Land company and Laut Lee who is the tour guide, is one of the employee of the company. 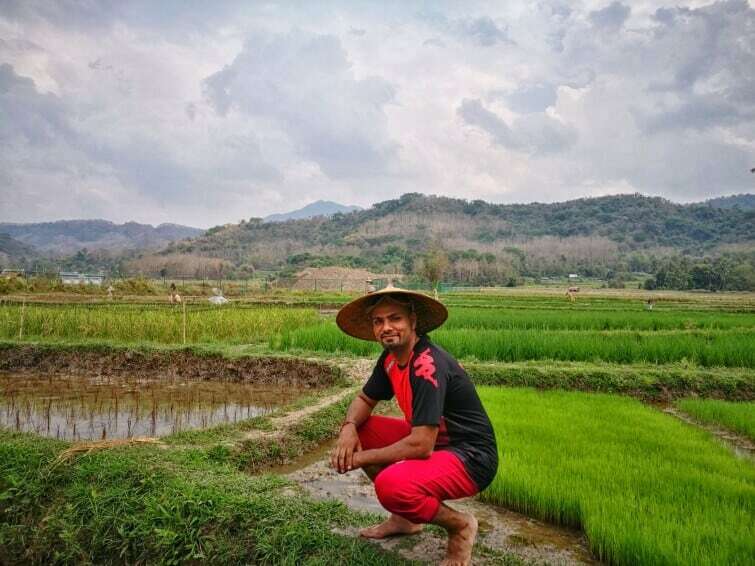 Lee gave us an introduction to this community enterprise set in such an idyllic countryside with the mountains and rice terraces view. 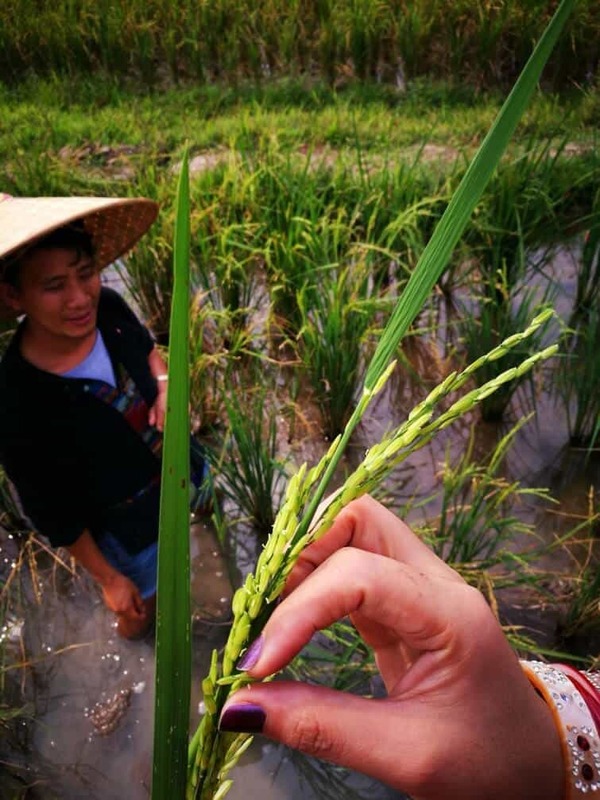 He brought us through 13 stages of rice growing and best of all, we had hands-on experience at all the stages. The mud experience was definitely fun and we could scrub the mud off at the washing station with the cool water and the best part of all, it was just two of us, no one else in the session. Lee speaks good English and he has a sense of humour and put us at ease very easily. He also brought us to the organic vegetable farm and he told us to pluck whatever vegetables we would like for lunch such as round carrots, longish red radish and some lettuce. The beautiful view of the rice farm. 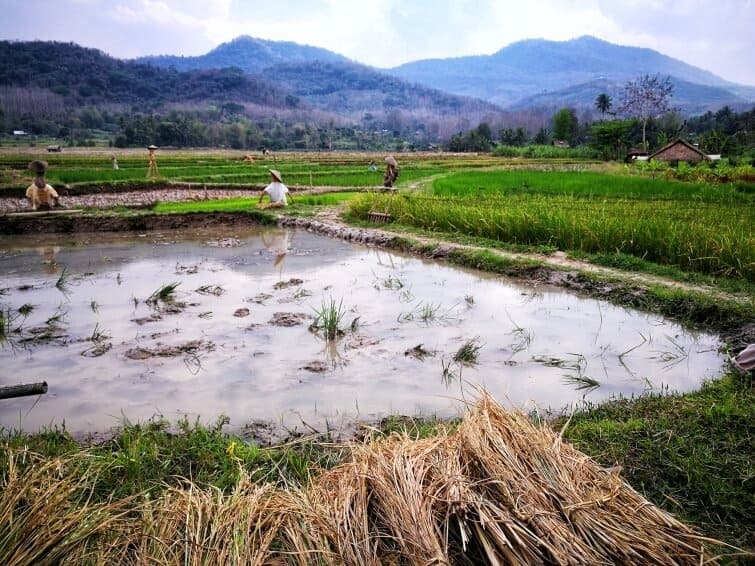 The 14 Steps to Planting, Growing, Harvesting, and Preparing Rice starts from here. Step 1: Selecting the Grain – To find the best grains, they’re placed in a saltwater solution: the sinkers are deemed healthy and good for planting. The salt is rinsed away in preparation for planting and the bad grains are given to livestock as feed. 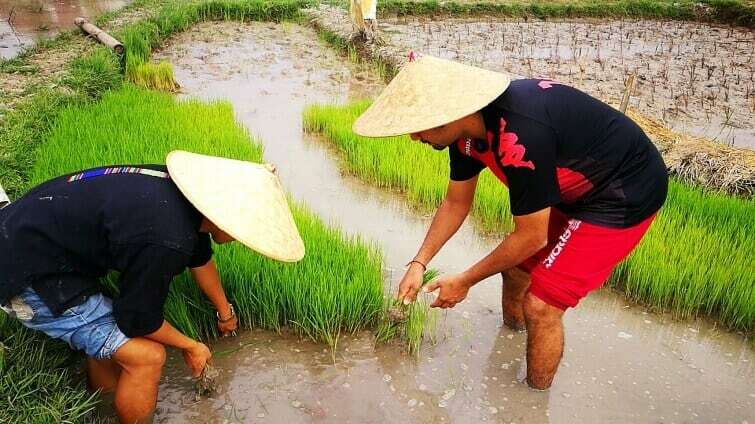 Step 2: Planting the Seeds in a Nursery – They use a nursery to make sure that conditions are perfectly controlled while the rice is still particularly susceptible. Step 3: Ploughing the Field – When the seedlings are strong enough, it’s time to plough the field. 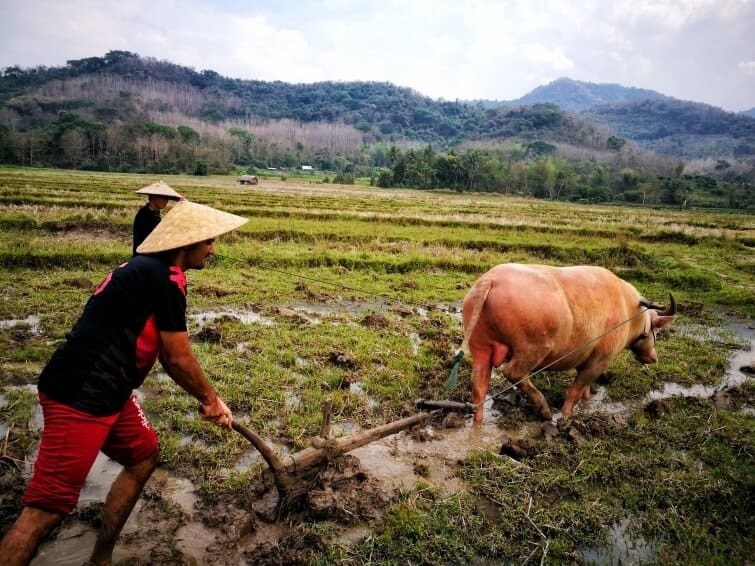 The Living Land Farm still uses water buffalo to assist in the ploughing, and someone still needs to guide Rudolf, their buffalo, along. Stepping out of my shoes and into 12 inches of mud, I’m ready to steer Rudolf along. Step 5: Water and Weed – The Living Land Farm uses irrigation to automatically water their fields and simply closes off fields by blocking the canals with mud. It’s a simple and effective technique. 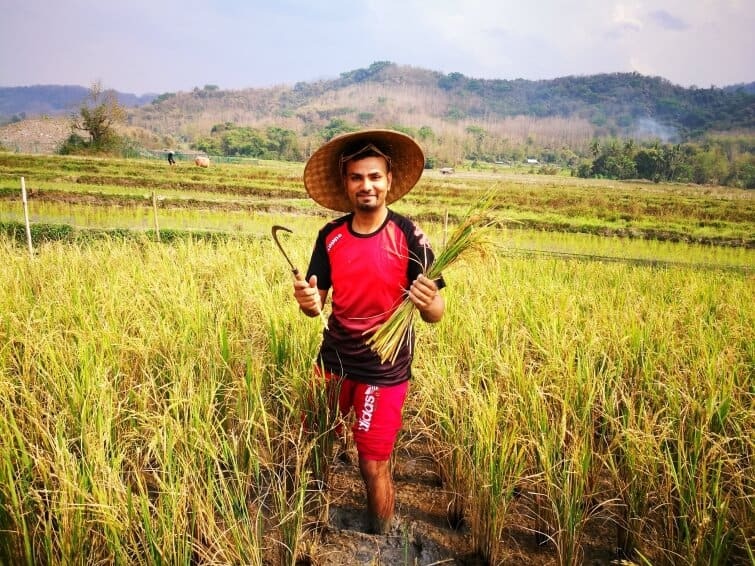 Step 6: Harvesting – Farmers keep a close eye on their rice crop because harvesting must be done at a specific point or else the grains will fall into the paddy, rendering them unusable. There’s no way to delay a harvest, so you just have to be ready when the time is right. Irrigation to the paddy is cut off, the stalks are cut near the base using a sickle, and then left to dry out in the sun for a few days. 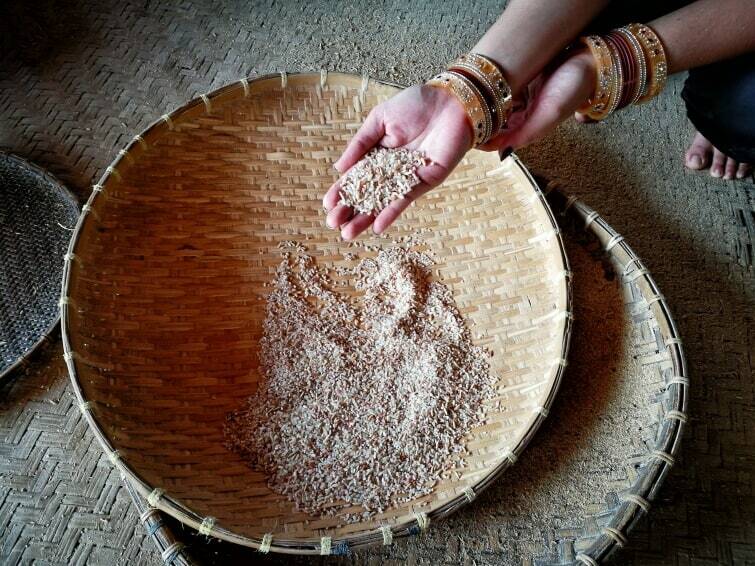 Step 7: Thrashing – When the rice is dry, the grains are thrashed against a board. Tirelessly, Laut beat stalk after stalk using a set of batons to release all the grains, then expertly tossing the stalks aside. If you’re wondering, I was quite good at this step. Step 9: Packing and Storing – Forty pounds at a time, rice is loaded into baskets to be transported into homes or storage. Laut showed us three different styles of baskets they use to carry the rice, but nothing changes the fact that it can be back-breaking work to carry 40 pounds of rice at a time, all day long. 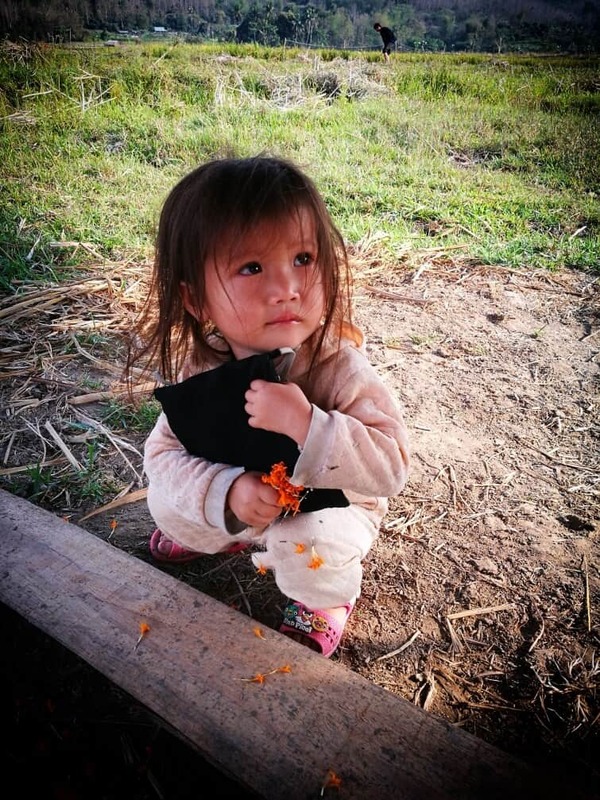 Found this little sweetheart at the paddy field, her father was working in the field (see far in the background) whilst she kept her self busy with her bag of flowers? 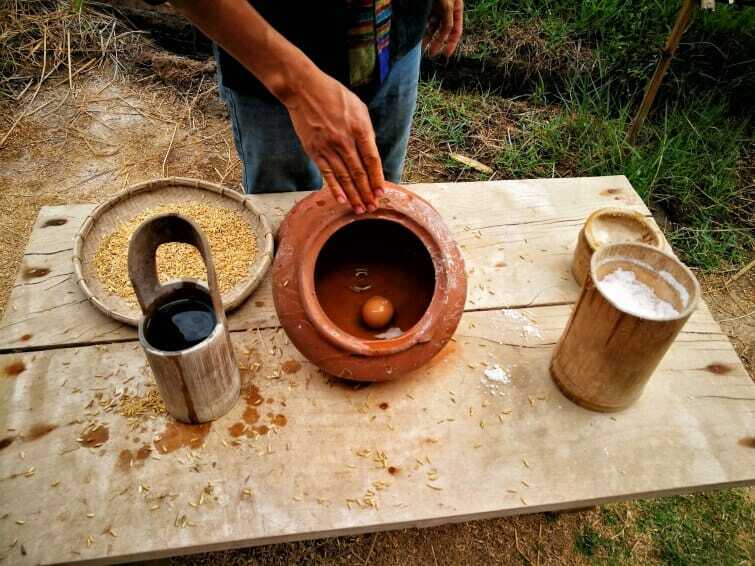 Step 10: Husking – The Living Land Farm still doesn’t use machines to release the husks from the grain of rice. They use a foot powered device to help with this work. 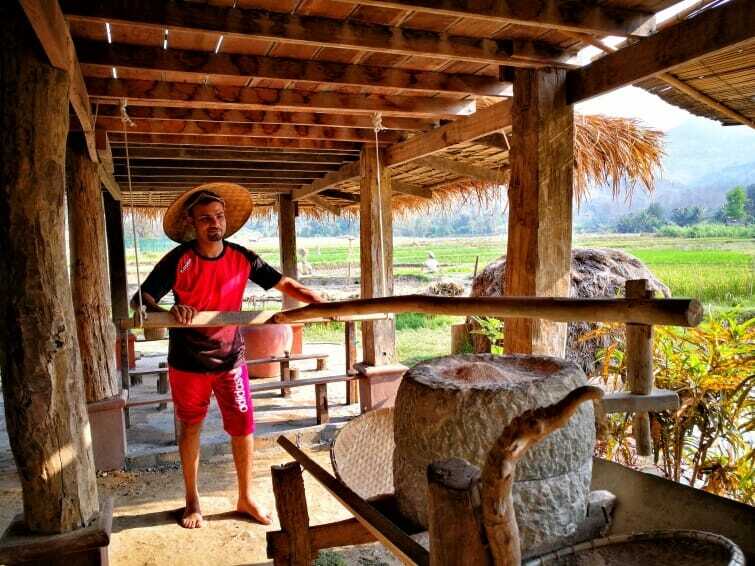 Grinding rice into flour – This is for making noodles etc. Step 11: Separating Grains from Husks – In the previous steps, the husks were physically removed from the grains, but you still need to sort the edible grains away from the husks themselves. 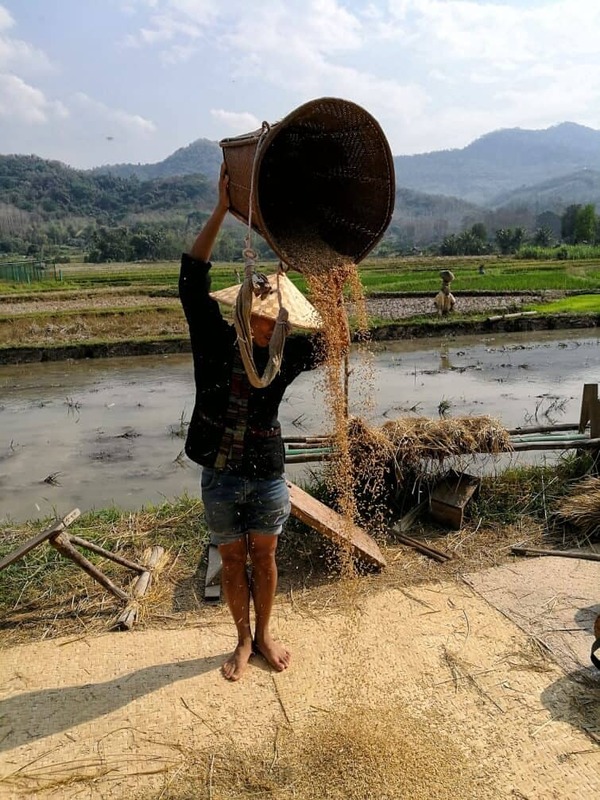 If you picked them through by hand, you’d never finish, so women use woven bamboo trays to move the rice around until all the lighter husks have flown off. This skill is one that needs lots of practice if you don’t want to just throw everything around and make a big mess. Step 12: Soaking Rice – All sticky rice (the Lao staple) needs to be soaked before cooking. Overnight is best, but if you’re in a rush, a mere six hours will be good enough in a pinch. Step 13: Cooking – Sticky rice is steamed, never boiled (or it gets too sticky). 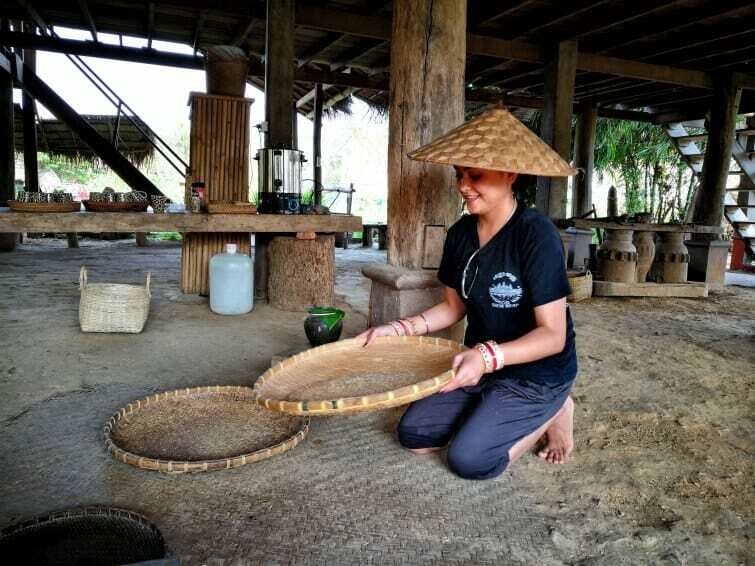 They use a bamboo basket that sits on top of a pot of simmering water. The rice, in one big ball, is flipped about halfway through cooking rather than being stirred. 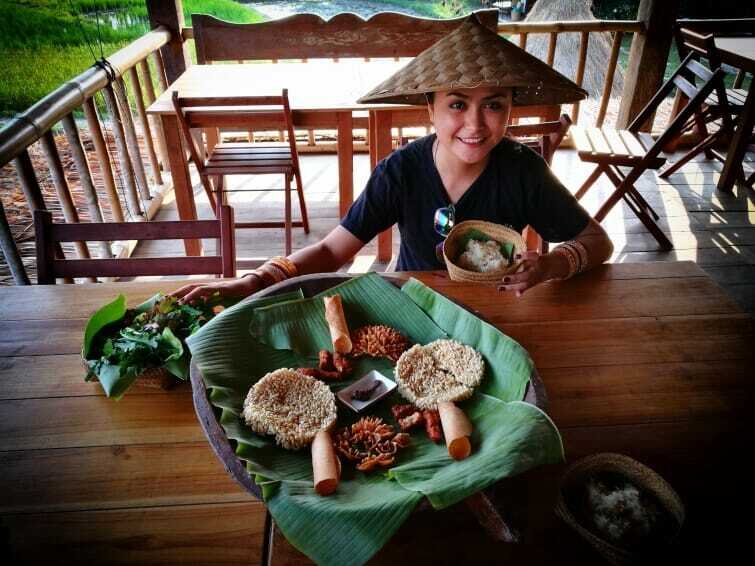 Step 14: Feasting – The easiest stage, eating the cooked sticky rice and a few other snacks made from rice and of course, our freshly harvested salad which was washed and cut for us. 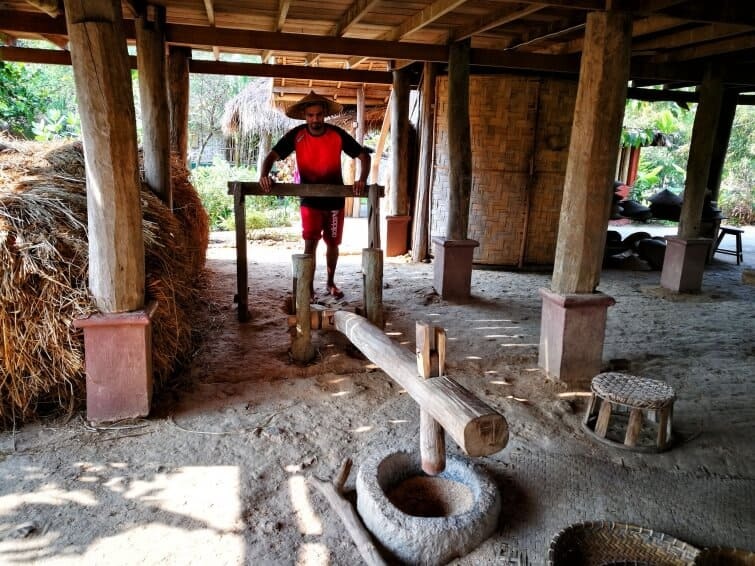 I also pressed our own sugar cane juice on an ancient wooden press. The juice tasted heavenly. Mixing up with the locals, he made a hat for me. 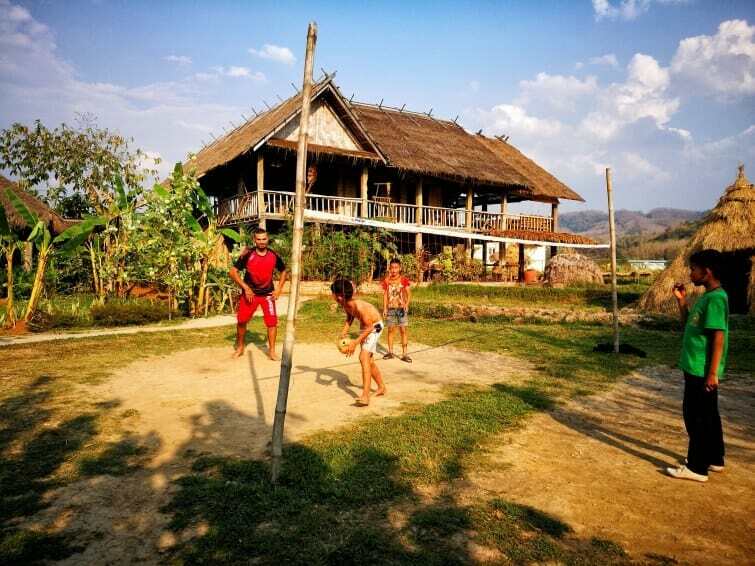 Later on the day, I joined the locals to play Sepak Takraw, a game which is quite popular in South East Asia. I thought I’ve beaten Lee in this game but on the final throw, he beats me! 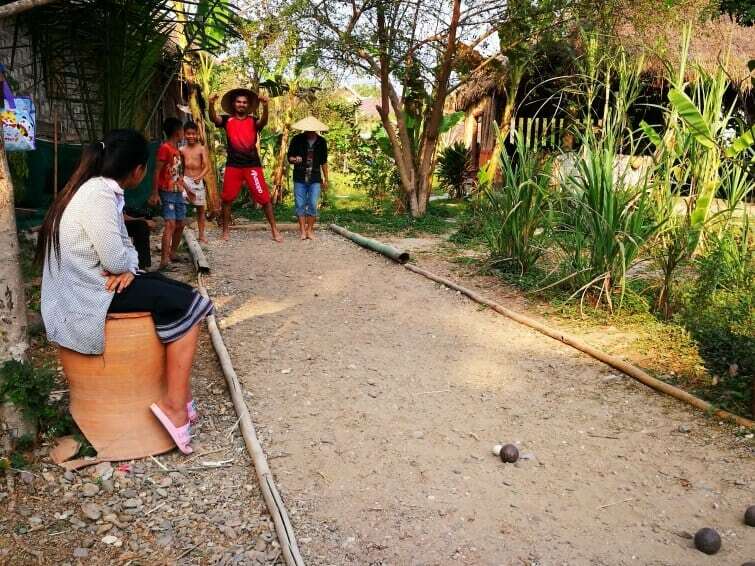 Good fun, it is similar to lawn ball game. 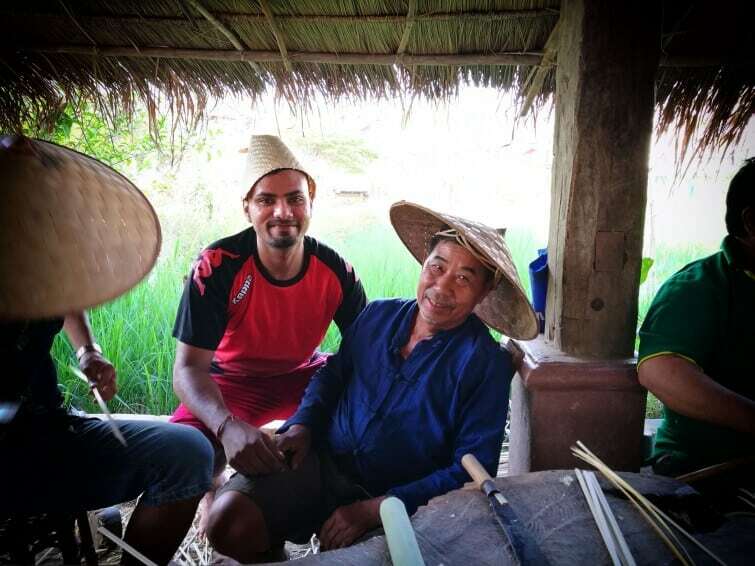 Check out the video highlights below of our rice farming experience. That was my half day highlight at this farm, it was a great experience. Beautiful place and really friendly and kind people running it plus they give the profits back to the community paying for English classes and other things which will improve the living of locals. An absolute must in Luang Prabang. Note: They are quite slow in replying emails but if you need to get hold of them, please call for faster response. This trip was part of my 6 Nation’s Borders Ride which I rode and clocked 8033KM on my 171CC scooter.